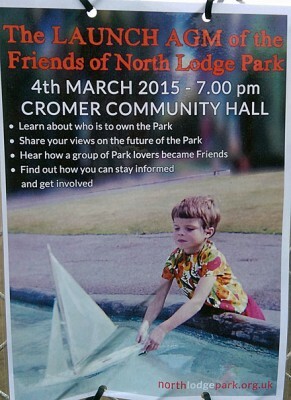 This is an important issue if you care about North Lodge Park, Cromer. We know that the NNDC has had its eyes on the putting greens as a potential pay and display car park and that due to financial constraints things are going to change in the Park. The indications are already there as the gardens are no longer receiving the attention they once did. If this Friends initiative is successful North Lodge Park could be saved and improved for future generations of visitors and Cromer families to enjoy. What an asset to the town this could be. My vision is of a well-maintained park with a high-quality play area for children, beautiful gardens full of colour, a thriving tearoom by the ever popular boating pond and a properly maintained putting and bowling green. Visitors to Cromer are the lifeblood of the town’s economy. We need to provide the best facilities we can for them to attract more during the vital summer season. If the proposal to install parking meters in the town goes ahead visitors will need to feel Cromer is value for money or they will simply go elsewhere. We need to provide that value for money. If you want to know more or become involved in the future of North Lodge Park please attend the meeting.